At A Plus Computers, we provide aid to customers in the High Desert and especially in the Apple Valley region. As a local business, our services are aimed at both businesses and home users who need fast, reliable service for their computer or computer systems. 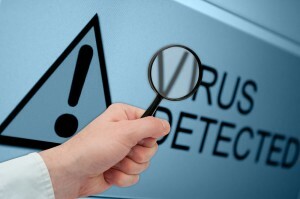 We offer an extensive line of help for malware and virus protection. PCs infected with spyware, malware, or viruses need repair. Not repairing infected systems can lead to risks such as identity theft, computer malfunctions, and the total loss of your system. If you have the following problems, bring your computer in to us for fast and convenient service. Does your browser seem to load strange pages and websites you did not choose? Do you have pop-up advertisements appearing on a regular basis or even constantly? Do you receive numerous system warnings or error messages when accessing information? Do you have screens displaying information that claims you must pay a fine to access your computer? Does your homepage keep changing? If you are noticing any of these types of problems, or your spyware programs have detected numerous threats, even if the program cannot fix it, it is best to bring your computer to A Plus Computers. Your PC experience is improved, and we will ensure your system is completely secure. We help you to speed up your PC’s performance. Our service is fast and affordable. Our effective and safe programs remove malware, spyware, and viruses from your computer, so you are no longer at risk. For those in the High Desert area, stop in with your computer or system at A Plus Computers. We will help your computer get back up and running fast.